The National Auto Sport Association (NASA) Western Endurance Racing Championship (WERC) Round 2 was held at Thunderhill Raceway Park. And, to keep things interesting, they ran the track in reverse. Just before the race began, raindrops hit the windshields of the cars as they sat on grid, forcing teams to make a last-second decision: rain tires or slicks? When the green flag dropped the clouds went away and the race was run in the dry. Teams who gambled to stay on slick tires (or by dumb luck just didn't have rain tires with them) were clearly the faster cars on the track as NASA's Round 2 of the WERC got underway. When the checkered flag fell, six different racing classes crowned six different winners. The ESR class is for the fastest machines built by man and NASA lets them run here. Winning first place in ESR and handily winning first overall was the number 88 prototype of Team Green Alternative Motorsports. The ES is the "run what you brung" class with everything from NASCAR chassis to pick up trucks. Winning first place in ES and second overall was the number 66 "pick'em-up-truck" of Team Super Truck. Taking second in ES was number 4 GTM of Team Prototype Development Group. Earning third in ES was the number 161 BMW of Team Stammer Inc. / Bavarian Performance. Class E0 has staked its German roots, with BMWs on every podium spot. Winning E0 and finishing third overall was the number 95 BMW of Team Bullett Performance. Taking second in E0 was the number 61 BMW of Team Road Shagger Racing. Pulling in third in E0 was the number 32 BMW of Team WolfKatz. 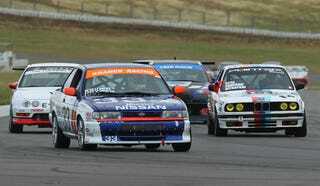 Class E1 is the fruit basket of racing with everything from Integras to Mustangs battling it out. Winning E1 was the fast and female Donna in her number 5 Acura Integra of Team Diva Speed. Earning second in E1 was the number 44 Ford Mustang of Team R & B Racing. Picking up the third spot in the E1 class was the number 14 Acura Integra of Team Speedy Motorsports. E2 was owned by the nimble little Mazda Miatas. Winning E2 in the number 89 Mazda Miata was Team Jiffy Lube Racing. Taking second in E2 was Laura Thomas (known for driving the Evil Genius Racing V8olvo Death Cab in the 24 Hours of LeMons) in her number 72 Mazda Miata of Team Momentary Laps Racing. Pulling in third in yet another Mazda Miata was Aaron Braverman in the red and clean number 99. While E2 was dominated by those pesky Miatas, E3 was owned by the Germans. Winning E3 was team WolfKatz2 in their number 35 BMW. Let's hear it for the four door! This thing can pick up the kids at school, some groceries and a NASA trophy! Taking second in E3 in the number 14 BMW of Team AD3R.1. Finishing up third in E3 was the number 93 BMW of Team J & F Racing. With Round 1 and Round 2 in the books, the next event of the six race championship series which ends during the 25 Hours of Thunderhill in December wil be a three hour enduro at Buttonwillow Raceway Park in June. The great racing photography was courtesy of Head-On Photos.